This is a comprehensive list of the secondary and P-12 schools in Brisbane that are holding an Open Day, Visitation Day or School Tour in 2019. We update this list of schools throughout the year with more detailed information as the schools share their Open Day details with us. If you don’t see the school you are interested in, please add in comments – if the school has let us know, we have included it. If you let us know, we can include it. 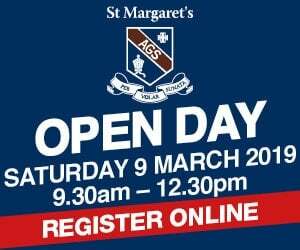 Looking for a specific Open Day’s date? Check our Events Calendar. A comprehensive listing of 2019 Open Days dates for Brisbane Schools including schools in the Moreton, Logan, Ipswich and Redland areas. Anglican Church Grammar School (East Brisbane) Anglican Boys’ School Reception-Yr 12 Open Day: Wed 8 May 10am - 1 pm. They also offer personalised tours and Headmaster’s Tours throughout the year. Aspley State High School (Aspley) Co-ed Yr 7 – Yr 12 Twilight tours: Wed Mar 13, 4.30pm - 6.30pm, Wed Aug 21 4.30pm - 6.30pm. Australian Trade College (Scarborough) Co-ed Yr 11 & 12 Hands on learning towards a trade career. Check their website for details. Brigidine College (Indooroopilly) Catholic Secondary Girls’ School Welcome Tours: Mon 4 or Tues 5 Mar; Mon 5 or Tues 6 Aug 9.30am - 10.30am; Twilight Tours: Tues 14 May & Tues 15 Oct 2pm - 6pm. Brisbane Adventist College (Mansfield) Co-ed Prep-Yr 12 Tour upon booking. Brisbane Christian College (Sailsbury) Co-ed Pre-prep-Yr 12 Open Days: 5 Mar, 21 May & 20 Aug for Primary School, and Middle & Secondary School. 29 Oct for Middle and Secondary School only. Brisbane Girls Grammar School (Brisbane) Girls’ Secondary School Open Day: Fri 2 Aug 4pm - 8pm. Organised tours throughout the year. Brisbane Montessori School (Fig Tree Pocket) Infants to Middle School (0 - 15 years) They conduct school tours 3 times a term. Check website for details. Calvary Christian College (Loganholme) Springwood Campus- Prep -6; Carbrook Campus- Childcare - 12 Check website to book a tour. Cannon Hill Anglican College (Cannon Hill) Co-ed Prep -Yr 12 Open Day: Sat 2 Mar 9am - 12 & Fri 2 Aug 9am to 12. Canterbury College (Waterford) Indep Co-ed Kindy – Yr 12 Open Day: Sat 18 May. Tours Morning: Wed 7 Mar and Wed 7 August. [email protected]: Wed 16 October. Carmel College (Thornlands) Catholic Co-ed Yr7-12 Visit their website to book a tour. Citipointe Christian College (Carindale) Independant Prep-Yr 12 Morning and Evening Tours: Tues 5 Mar 5:00pm, Tues 21 May 9:00am, Tues 27 August 9:00am, Tues 22 October 5:00pm. Clairvaux MacKillop College (Upper Mt Gravatt) Catholic Co-ed Yr7-12 Window Days: Fri 8 Mar 9am - 11am, Fri 3 May 9am - 11am, Wed 12 June 9am - 11am, Fri 26 July 9am - 11am, Fri 30 Aug 9am - 11am. Girls Pre-Prep-Yr 12 Open Mornings: Thurs 14 Mar 8:45am to 11am, Tues 21 May 8:45am to 11am, Clayfield Fair – Sunday 4 Aug 10am to 3:00pm. Faith Lutheran College (Thornlands & Victoria Point) Junior, Middle & Senior School Campus Yr 7-Yr 12 Visit website to arrange a personal tour. Grace Lutheran Primary School (Clontarf) Co-ed Prep-Yr 7 Principals Tours: 12 Feb, 14 Mar, 2 Apr, 9 May, 18 June, 18 July, 20 Aug, 17 Sept, 17 Oct. Times vary. Check website for more. Hillbrook Anglican School(Enoggera) Co-ed Secondary School For more details on Hillbrook in Action and to arrange a personal tour visit. Ipswich Grammar School (Ipswich) Indep Boys' School Prep - Yr 12 Open Day: Thurs 23 May. John Paul College (Daisy Hill) Co-ed Early Yrs-Yr 12 Open Days: Sat 9 Mar 10am - 2pm, Primary School Open Morning, Thur 6 June 9am -11am, Senior School Open Morning Thur 15 Aug 9am - 11am, Twilight Open Evening Weds 16 Oct 4pm - 7 pm. 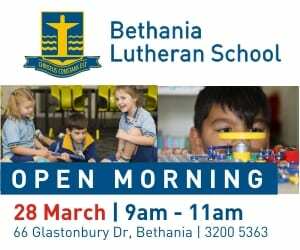 Living Faith Lutheran Primary School (Murrumba Downs) Co-ed Prep-Yr 6 Open Mornings: Thurs 28 Feb & Wed 14 Aug 9.00am - 10.30am. Loreto College (Coorparoo) Catholic Girls’ Secondary College Open Day: 11 August 9am – 12pm, College Tours: 13 Mar, 5 June, 23 Oct 9am - 10.30am. Lourdes Hill College (Hawthorne) Catholic Girls’ Secondary School Open Day: Fri 11 Oct 3:30pm – 7pm. Marist College (Ashgrove) Yr 5-Yr 12 Open Days: Fri 22 Feb, Fri 22 Mar, Fri 31 May, Fri 2 Aug, Fri 18 Oct.
Mary MacKillop College (Nundah) Girl's Secondary College yr 7 - 12 Open Day: Sun 20 May 10am - 1pm, Enrolment Info Evening – Mon 4 Mar 4.30pm - 6pm, Enrolment Info Evening – Tue 27 Aug 4.30pm - 6pm, Arts Showcase & Open Evening Thur 24 Oct 5.30pm - 8.30pm. Moreton Bay Boys’ College (Manly West) Boys’ College Pre-Prep-Yr 12 Head of College Tours: Wed 20 Feb, Wed 13 Mar, Wed 1 May, Fri 7 June, Fri 19 July, Fri 30 Aug, Fri 11 Oct.
Mount St Michael's College (Ashgrove) Catholic Girls’ Secondary School Open Evening: Fri 1 Mar 3.30pm – 6pm. Mt Maria College (Petrie) Catholic co-ed Secondary College College Tours: Fri 8 Feb, Fri 1, 15, 29 Mar. Mueller College (Rothwell) Co-ed College Prep-Yr 12 Every day is open day, book a tour online. Music Industry College (Fortitude Valley) Indep Co-ed Music College Yr11-12 Check website for Open Day details. North Lakes State College (North Lakes) Co-ed Prep-12 Check website for Open Day details. Northpine Christian College (Dakabin) Indep Co-ed College Kindy – Yr 12 Open Evening: 29 May. 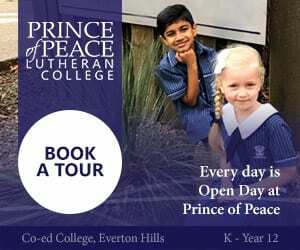 Prince of Peace Lutheran College (Everton Hills) Co-ed Kindy-Yr 12 Junior Campus Open Mornings: Thur 14 Mar, Thur 9 May, Thur 8 Aug, Thur 17 Oct. Senior Campus Open Morning – Wed 29 May 8.30am – 10:30am Senior Campus Expo – Tue 13 Aug 3:30pm – 6:30pm. Redlands College (Wellington Point) Co-ed College Prep-Yr 12 Open Day: 8 Mar 9:30am - 11:30am, 27 July 9:30am - 11:30am. Discover Prep: 21 March. Rochedale South State School (Rochedale South) Co-ed Pre-Prep-Yr 6 Open Day: Wed 20 March. Talk & Tour dates: Thurs 2 May, Tues 23 July, Fri 18 Oct, Tues 12 Nov, all 9.15-10.15am. Information evening: Tues 6 June, 6-7pm. Somerville House (South Brisbane) Girls' School Prep-Yr 12 Open Day: Sun 19 May 11am - 2pm, Tour Morning: Thur 15 Aug 8am to 12pm. Southern Cross Catholic College (Scarborough) Catholic Co-ed Prep-Yr 12 Open Day: Sun 19 May 10am – 1pm Head of Secondary Tours Thur 14 Feb, Thur 9 May, Thurs 22 Aug, Thur 24 Oct from 9.30am. 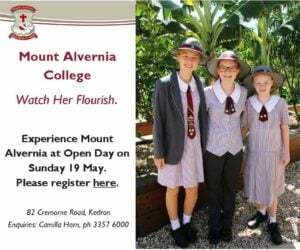 St Aidan’s Anglican Girls’ School (Corinda) Anglican Girls’ School Kindy-Yr 12 Open Day: 26 Mar, Open Mornings: 23 May, 8 Aug, 21 Nov.
St Eugene College (Burpengary) Catholic Co-ed College Prep-Yr 12 Open Morning: Tue 26 Mar. Personal tours every Weds throughout the year. St James College (Brisbane) Catholic Co-ed Secondary College Open Day: Fri 2 Aug. Tours of the College take place throughout the year. 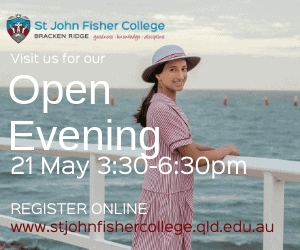 St John Fisher College (Bracken Ridge) Catholic Girls’ Secondary School Open Day: Tues 21 May 3:30pm - 6.30pm, College Tour: Fri 8 March, 9:30am. Wed 18 Sept - Principal's Morning Tea at 9.30am & Principal Meet and Greet at 6.30pm. Tours of the College take place throughout the year. 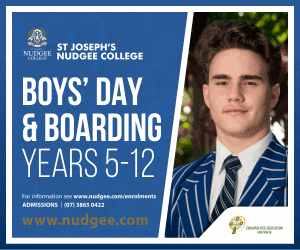 St Joseph’s Nudgee College (Boondall) Catholic Boys’ College Yr 5-Yr 12 Open Day: Sat 18 May 10am - 2pm. Open Morning: Tues 13 Aug 9am - 11.30am. St. Joseph's College, Gregory Terrace (Spring Hill) Catholic Boys’ College Yr 5-Yr 12 Open Day: 19 Aug 3.30pm – 6pm. St Laurence’s College (South Brisbane) Catholic Boys’ College Yr 5-Yr 12 Twilight Open Day: Thur 28 Feb 4pm – 7pm. 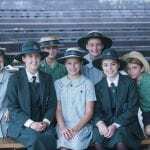 St Margaret’s Anglican Girls School (Ascot) Anglican Girls’ School Pre-prep-Yr 12 Open Day: Sat 9 Mar 9.30am – 12.30pm, Open Morning: Thurs 15 August 8am – 11am. St Patrick's College (Shorncliffe) Catholic Boys’ College Yr 5-Yr 12 Open Day: Tues 28 May 3.30pm - 6pm. St Paul's School (Bald Hills) Anglican Co-ed Prep-Yr 12 Open Mornings: Junior School Thur 7 Feb 9.15am – 12, Year 7 Fri 1 Mar & Thur 9 May 9am – 11am, Twlight Open Evening: Junior School Fri 3 May 4.15pm – 6pm. 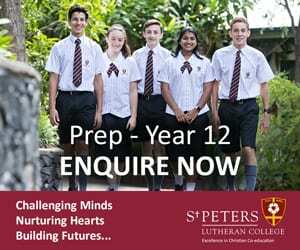 St Peters Lutheran College (Indooroopilly) Indep Co-ed Prep – Yr 12 Open Day: Sat 8 June. St Thomas More College (Sunnybank) Catholic Co-ed College Yr 7-Yr 12 Visitors' Days: Tue 12 Mar, Tue 21 May, Tue 20 Aug, 9.15am or 4.15pm. Stuartholme School (Toowong) Catholic Girls’ Secondary School Open Day: Sat 9 Mar. Action Tour Mornings: 8 Feb, 13 May, 10 June, 19 July, 15 Aug, 16 Sept, 11 Oct.
Villanova College (Cooparoo) Catholic Boys’ College Yr 5-Yr 12 Open Day: Wed 13 Mar 8.30am - 10.30am. Principal's Tours: 1 Feb, 1 Mar, Apr, 3 May, 7 June, 2 Aug, 6 Sept, 1 Nov.
West Moreton Anglican College (Karabin) Anglican Co-ed Prep - Yr 12 Every day is Open Day. Visit website to book a tour. Fab listing! you’ve got everyone here! This is a great reference – will you do it again in 2016 when we are looking for schools? Lots of open days coming up! We’ve looked at a few of these. So much to take into consideration when you choose a school. What a great list! Thankyou! So pleased to see this list…especially with so many days coming up. A scholarship list would also be handy. Thank you so much! Very helpful! Not sure who is going to help me when all the kids are at school and I am a crazy lady though!! My daughter is two and I am already exploring options for schooling, this is so handy to know. A great starting point for me as I have very little idea about primary children’s education. Thanks guys! Do you take your child to the primary school open days? could you please upload govt secondary high school open day ,i mean govt and private separately . We cannot do this separtely – but will add the state schools as they let us know. We include EVERY school that tells us about their Open Day! Do you know the date this year? Families Magazine is an A4 glossy magazine printed every 2 months for families with kids aged 0 - 17 and distributed in places where families are across Brisbane, Ipswich, the Gold Coast and Toowoomba.